We will try to list companies that offer handicap beach access services. If your company offers such services, let us know, and someone will contact you. If your house or condo complex has handicap accessible features or special programs for the handicapped let us know about this as well. If you as a visitor, see some need, drop us an e-mail. We are working to develop a new page that will list some of the accessible condos and beach houses in the area. Due to the nature of our area beaches, not all beach rentals are accessible. Click Here to Book A Destin Beach Wheel Chair Online Today! 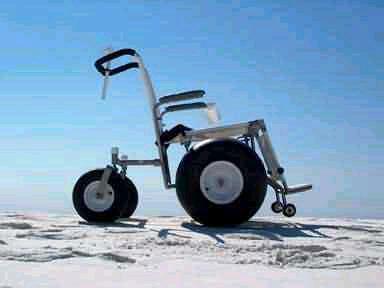 DeBug wheelchairs allow handicapped persons to enjoy Destin's white sand beaches too. Although not shown in this photo, this chair comes with it's own umbrella. Some area parks rent these wheel chairs for day use. Due to the nature of the area beaches, not all beachfront rentals are suitable for these wheelchairs, in fact most are not suitable, and you should determine the suitability of your rental before renting a beach wheelchair.